We have that healthy solution at RHRLI. It’s called the ARTAS® System and it uses robotic technology to perform a minimally invasive hair transplant. Most ARTAS® patients report little to no pain and they’re able to return to their normal life in a few days. When you consult with us, you’ll experience the RHRLI edge. That means our board-certified surgeon, Dr. Baiju Gohil will take the time to explain the entire process to you. He’s also involved in all procedures and you will be the only patient he works with on the day of your hair transplant. We will give you all the information we need and let our state-of-the-art technology do the rest. We want well-informed patients, so here’s what you need to know about the keto diet and hair loss. According to NBC News, the keto diet, short for the ketogenic diet, is a high-fat, low-carb diet that will put your body in a state of ketosis. This means that stored fat will be used as energy. If you consume less than 50 grams of carbs a day, “you’ll consume an enormous amount of fat,” Shahzadi Devje a Toronto based dietitian told NBC. By following the diet, your body will start to produce ketones within a day or two, which means your body will be metabolizing your fat intake as energy. There are downsides to keto with reported side effects including lethargic behavior related to a drop in blood sugar, bad breath, headaches, and nausea. But what about hair loss? There’s divided opinion about this, but Melanie Brown, a nutritional therapist tells the British Daily Telegraph that about 10 percent of patients on low carb diets do experience hair loss. More research is needed to show if there’s a link between keto and hair loss and there are a number of theories about what might be responsible for hair loss related to keto. Many point to telogen effluvium, a hair loss condition that sometimes occurs when you begin to shed hair because of a shock to the system. 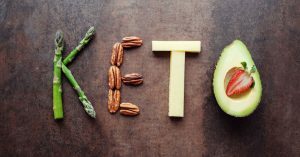 It’s theorized that the changes to your body that occur during the initial stages of the keto diet could contribute to this condition. Whether or not hair loss occurs, telogen effluvium is considered a temporary condition. If you’re looking for a permanent solution to hair loss, there’s no reason why you should suffer a shock to your system. RHRLI is the only hair loss treatment center on Long Island that has the minimally invasive ARTAS® procedure. You’ll have a new head of hair that will change your life. Contact RHRLI today.